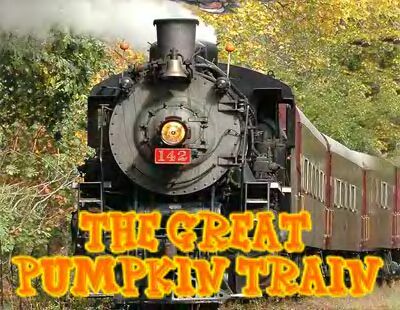 The Great Pumpkin Train Starts This Weekend! This weekend starts The Great Pumpkin Train. Ride the train and every child gets to pick ONE pumpkin for free! Also new this weekend is our new add on to the Mine train. Come see what comes out of the mine shaft when the mine blows up! The great Pumpkin Train runs from September 29 to the end of October, weekends. 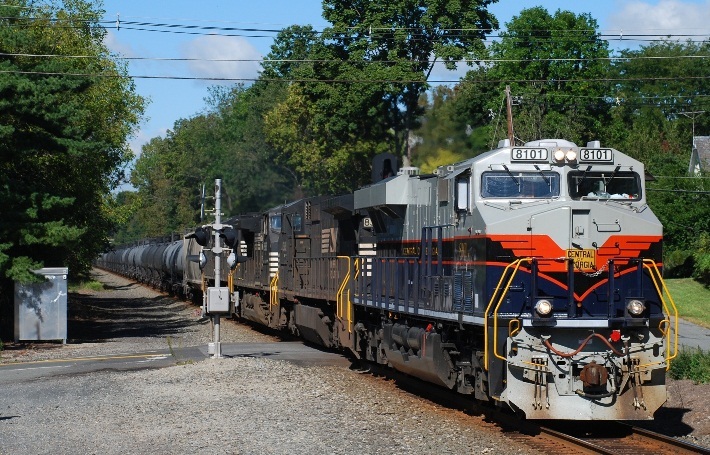 Ride our steam train through the beautiful fall landscape of Western New Jersey. 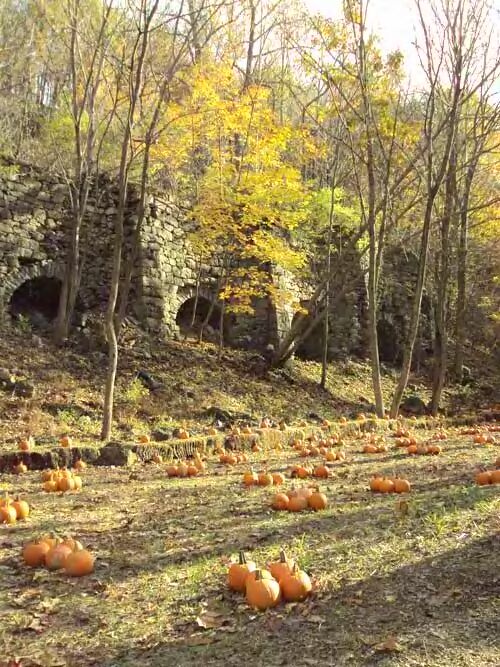 Take the train to the pumpkin patch located in a little glade in front of the historic Carpentersville Lime Kilns dating from the 1700's. Once we arrive at the Pumpkin Patch everyone is welcome to get off the train and EVERY CHILD can pick their own pumpkin for FREE. 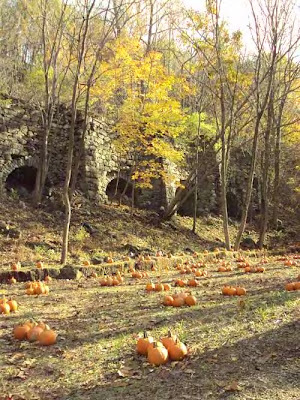 For more family fun add the CORN MAZE & OLE' SUSQUEHANNA MINING COMPANY (for an additional charge) experience to your Pumpkin Train ride! Sept 29th & 30th and every weekend in October! NORFOLK, VA. – Trains hauling sand used in extracting natural gas from the Marcellus Shale formation soon will have the ability to unload five times faster thanks to a $20 million upgrade at the Horseheads (N.Y.) Sand & Transloading Terminal (HOST). Owned and operated by Carriage House Partners and RLB Holdings, HOST is in the final stages of constructing a 90,000-square-foot transloading building, scheduled to be completed by Oct. 8. HOST also broke ground this month on a second 90,000-square-foot transloading facility to be opened in 2013, and both buildings are designed for the storage of sand. When completed, these new facilities will allow Norfolk Southern trains to unload 100 freight cars within 48 hours. HOST is strategically located about two miles from Interstate 86 and covers more than 200 acres of a former military base. “HOST is committed to making this facility a ‘best in class’ leader in servicing the natural gas industry with warehousing, more than 2 million square feet of storage, and more than five miles of rail at the site,” said Ray Bartoszek, managing partner of HOST. Norfolk Southern has served the terminal since 2009, when the railroad unloaded 104 cars there. During 2010 and 2011, the number of cars increased to 1,800 and 2,600 respectively, while 1,400 cars have been unloaded through the first half 2012. 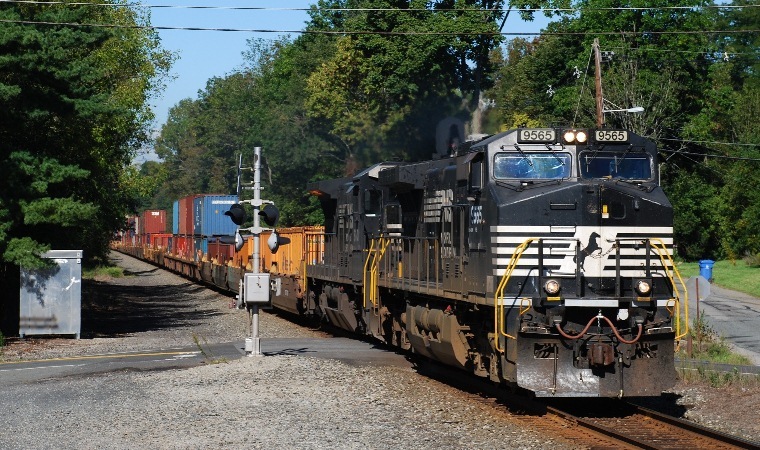 Norfolk Southern Corporation is one of the nation’s premier transportation companies. 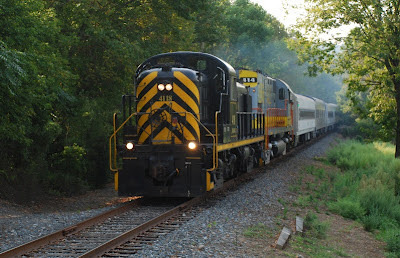 Its Norfolk Southern Railway subsidiary operates approximately 20,000 route miles in 22 states and the District of Columbia, serves every major container port in the eastern United States, and provides efficient connections to other rail carriers. Norfolk Southern operates the most extensive intermodal network in the East and is a major transporter of coal and industrial products. The Maywood Station Museum, 269 Maywood Avenue, Maywood, NJ will host Annual Railroad Day at the Maywood Station Museum and an outdoor free concert by the band Blue Plate Special as part of the Maywood Station Museum Backyard Summer Concert Series sponsored by Park Ave Acura on Sunday, September 30, 2012 from Noon to 3pm. Assorted railroad collectibles and model trains will be for sale by vendors and railroad historical societies plus Blue Plate Special will perform a concert featuring a mix of folk, bluegrass, country and rock. The museum will also be open featuring an assortment of displays, artifacts and photographs on exhibit and visitors are invited to climb aboard restored Caboose 24542 and view its operating model train layout and additional photographs and displays. The Maywood Station Museum is one of the most acclaimed all-volunteer, non-profit museums in the State of New Jersey. Plan a visit to take a step back in time and enjoy a great free concert. For more information, please visit the Maywood Station Museum website at www.maywoodstation.com or the Maywood Station Museum Facebook page. Admission is free. Donations are welcome. In the event of rain, the concert portion of the Museum Open House will be postponed to a later date. 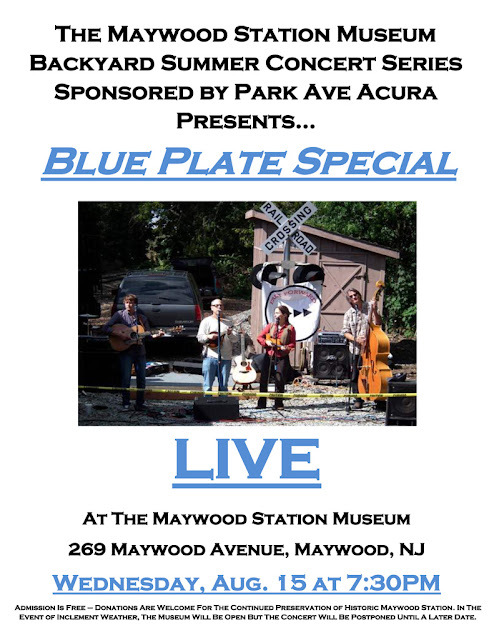 Following is a flyer from a concert given in August by Blue Plate Special at the Maywood Station Museum. Special Guest at our train show!!! The Lehigh Valley Chapter, NRHS will be holding their annual Train & Railroadiana Show at Dieruff High School in Allentown, PA this weekend, September 30, 2012 from 10 AM to 4 PM. Admission is $4.00 per person, under 5 free, all proceeds benefit the Lehigh Valley Chapter, NRHS. Timetables, lanterns, toy trains, pictures, railroad china, model trains, books, lock and keys. This year we will have a special guest exhibiting their work. Andrew Fletcher (creator of the initial drawings for NS heritage units) will be showing off his work and distributing copies of his Heritage Units poster. Be sure to stop by and take advantage of meeting this interesting person. Received the following via email from The Delaware River Railroad Excursions in Phillipsburg, NJ. Family four pack of tickets giveaway! CLICK HERE TO ENTER TO WIN THE TICKETS! Simply click the link above and "like" us on Facebook for a chance to win a family 4 pack of tickets worth $96.00! Sweepstakes ends September 28, 2012 @ 09:00 pm (US/Eastern). trains leave 11 AM, 12:30, 2 ,OR 3:30 Saturdays or Sundays. Following is an Amtrak News Release. WASHINGTON— Beginning tonight and continuing into next week, Amtrak plans to operate high-speed test trains at 165 mph in four areas covering more than 100 miles of the Northeast Corridor. The tests in Maryland / Delaware, New Jersey, Rhode Island and Massachusetts are locations that may at some future time experience regular 160 mph service. The tests will utilize high-speed Acela Express equipment and will measure the interaction between the train and the track, rider quality and other safety factors. The test runs must be performed at 5 mph above the expected maximum operating speed of 160 mph. The test areas between approximately Perryville, Md. – Wilmington, Del. (21.3 miles) and Trenton – New Brunswick, N.J. (22.9 miles) currently have a maximum speed limit of 135 mph. The test areas between approximately Westerly – Cranston, R.I. (29.2 miles) and South Attleboro – Readville, Mass. (27.8 miles) currently have a maximum speed limit of 150 mph. The same areas were used for similar high-speed tests before the introduction of Acela service. The initial test run is in New Jersey where Amtrak is presently advancing design, engineering and other pre-construction activities for a $450 million project funded by the federal high-speed rail program. The project includes upgrading track, electrical power, signal systems and overhead catenary wires to improve reliability for Amtrak and commuter rail service, and is necessary to permit regular train operations at the faster speeds. Some construction activity is anticipated in 2013, but the project will ramp up dramatically thereafter to be completed in 2017. Amtrak is America’s Railroad®, the nation’s intercity passenger rail service and its high-speed rail operator. A record 30.2 million passengers traveled on Amtrak in FY 2011 on more than 300 daily trains – at speeds up to 150 mph (241 kph) – that connect 46 states, the District of Columbia and three Canadian Provinces. Amtrak operates intercity trains in partnership with 15 states and contracts with 13 commuter rail agencies to provide a variety of services. Enjoy the journey® at Amtrak.com or call 800-USA-RAIL for schedules, fares and more information. Join us on facebook.com/Amtrak and follow us at twitter.com/Amtrak. ... from photographing the CSX and NS freights that pass through my area by chasing some special excursions on Saturday. First up was Erie Lackawanna Dining Car Preservation Society's excursion train to Scranton's La Festa. 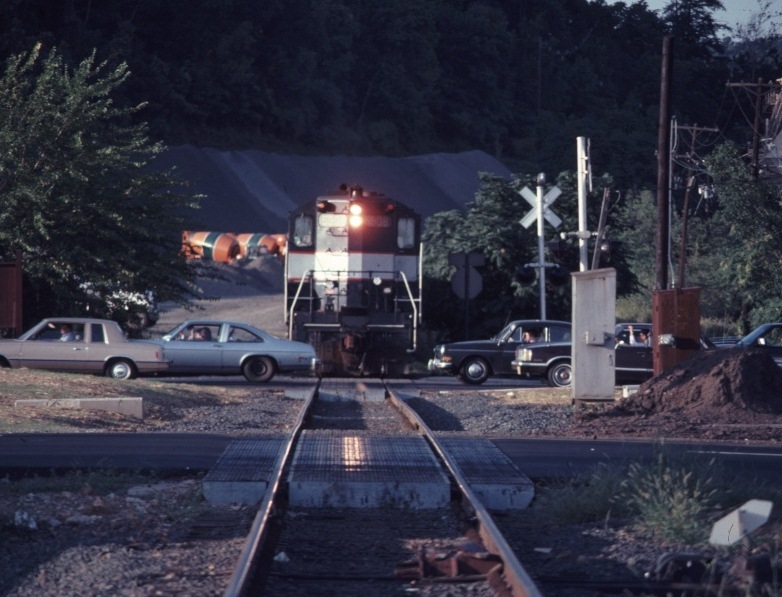 People who chose to attend this festival could board the train at the Delaware Water Gap, East Stroudsburg or Cresco stations. Seen here approaching the Logging Road 45061 grade crossing after departing the Delaware Water Gap station right on time at 9 AM. In the lead is the D&L's 4118. It is an Alco RS3 and ex-D&H 4118 heritage. The second unit is D&L 414 (a C420 ex-LV 414). D&L 414 is a genuine LV locomotive wearing its "as delivered" paint scheme. Only the ditch lights and the FRA required striping are different from what this locomotives looked like in 1963 when delivered to the LV. After this train had passed, it was time to drive back to NJ to photograph BR&W's first of two special passenger excursions. Shortly before noon, a whistle was heard signaling its approach to Three Bridges. BR&W 2102 was in charge of two coaches. As the train slowly made its way past my photo location, one conductor shouted out to me to "...check out the drumhead!" The drumhead proclaimed that this train was called "The Hunterdon Flyer". JACKSONVILLE, Fla. - September 20, 2012 - CSX Corporation (NYSE: CSX) will release third-quarter financial and operating results on Tuesday, October 16, 2012, after the market close. The company will host an earnings conference call at 8:30 am Eastern Time on Wednesday, October 17, 2012 via teleconference and a live audio webcast. Presentation materials and access to the audio webcast will be available on the company's website at http://investors.csx.com. Following the earnings call, a webcast replay and a MP3 audio file will be archived on the company's website. CSX Corporation, based in Jacksonville, Fla., is one of the nation's leading transportation companies, providing rail, intermodal and rail-to-truck transload services. The company's transportation network spans approximately 21,000 miles, with service to 23 eastern states, the District of Columbia and two Canadian provinces. CSX's network connects more than 240 short line railroads and more than 70 ocean, river, and lake ports. More information about CSX Corporation and its subsidiaries is available at www.csx.com. Like us on Facebook (http://www.facebook.com/OfficialCSX) and follow us on Twitter (http://twitter.com/CSX). NORFOLK, VA – Norfolk Southern Corporation (NYSE:NSC) announced that third quarter 2012 earnings are expected to be in the range of $1.18 to $1.25 per diluted share, primarily due to volume declines in certain markets and lower revenues from fuel surcharges. Decreased coal and merchandise shipments, offset in part by growth in intermodal volumes, are together expected to reduce revenues by approximately $120 million compared with third quarter 2011. Fuel surcharge revenues are anticipated to be approximately $80 million below the same period last year. Third quarter 2011 fuel surcharge revenues included a favorable lag-effect of $52 million, whereas results for the current quarter are expected to be impacted by an unfavorable lag-effect in the range of $25 to $30 million. Norfolk Southern will discuss its expected third quarter performance during the Citi Global Industrials Conference in Boston on Thursday, Sept. 20, at 11 a.m. Interested investors can listen via simultaneous webcast at http://www.veracast.com/webcasts/citigroup/industrials2012/81205327.cfm, and the presentation will be posted at www.nscorp.com. 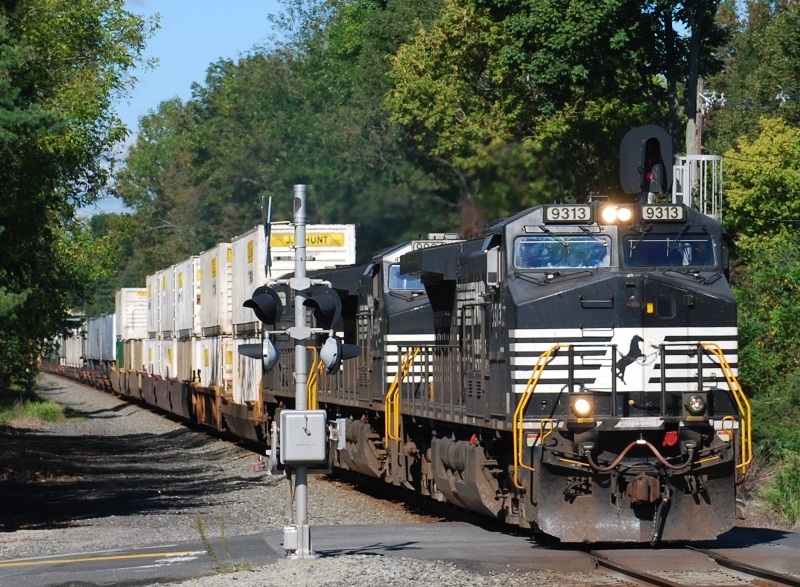 Norfolk Southern will report earnings and other results after market close on Tuesday, Oct. 23. Any statements contained in this news release that are not related to historical facts are forward-looking statements as that term is defined in the Private Securities Reform Act of 1995. Such forward-looking statements are subject to risks and uncertainties (noted in Norfolk Southern’s SEC filings) which could cause actual results to differ. The fifth annual Northeast Fallen Flags Prototype Modelers Meet will take place on Saturday, September 29, 2012, at the Ted Blum 4-H Center, 310 Milltown Road, Bridgewater, NJ, 08807. This spacious venue, just off of NJ Route 202, is also easily accessible from Interstates 78 and 287. Admission is $20.00 in advance ($25.00 at the door) and includes a hot Italian Lunch buffet at 1 PM. Also, a 4-H club will be selling Muffins, Bagels and Danish from 9 until 11:30 AM; soft drinks and coffee will be available throughout the day for a small donation. This gathering is a full day of clinics, model displays, vendors, a limited raffle (please donate new items, proceeds benefit 4-H), a great lunch and a chance for modelers to get together and bring any models they are working on or have finished, for display and discussion and learning. The model display is the heart of any RPM meet, so bring your work to show around. There are plenty of tables set to a comfortable height for viewing. We are working on Friday night and/or Sunday afternoon layout tours also. Please visit our website at http://www.hansmanns.org/neff_rpm/ , our Yahoo Group at http://groups.yahoo.com/group/neffrpm/ and our Facebook page at http://tinyurl.com/2cgcroh to sign up for the latest news and for directions and lodging information. If you have a presentation or clinic you would like to show, or would like to inquire about vending, please contact us at neffrpm@yahoo.com or leave a message with Jim Harr of Stella Scale Models at 908-797-0534. JACKSONVILLE, Fla. – September 19, 2012 – CSX Corporation (NYSE: CSX) announced that it was named to the Dow Jones Sustainability Index (DJSI) for North America for the second consecutive year and was the only U.S. railroad listed in 2012. CSX received high marks for its work in climate change strategies and environmental management, as well as in corporate governance and human capital development. CSX recently committed to reducing its greenhouse gas emissions intensity 6 to 8 percent by 2020 and announced in early 2012 plans to hire approximately 3,000 new employees this year, primarily to make up for attrition. In addition, the company expects to make $2.25 billion of capital investments in 2012, including a number of critical infrastructure and strategic initiatives. “Over the last several years, we have witnessed a continued and growing interest in long-term investment strategies that include sustainability investing,” said David Blitzer, managing director and chairman of the S&P Dow Jones Index Committee, S&P Dow Jones Indices. The DJSI is a partnership between the Dow Jones Indexes and SAM Sustainability Assessments which rates the top corporate performers in financial performance and sustainable business practices. Every year, the DJSI invites the world’s 2,500 largest companies to report on their sustainability practices across economic, environmental and social criteria. To learn more about CSX’s most recent Corporate Social Responsibility Report, visit www.csxcsr.com. More information about the DJSI is available at http://www.sustainability-index.com/. CSX Corporation, based in Jacksonville, Fla., is one of the nation’s leading transportation companies, providing rail, intermodal and rail-to-truck transload services. CSX’s network spans approximately 21,000 miles, with service to 23 eastern states, the District of Columbia and two Canadian provinces. CSX’s network connects more than 240 short line railroads and more than 70 ocean, river, and lake ports. More information about CSX Corporation and its subsidiaries is available at www.csx.com. Like us on Facebook (http://www.facebook.com/OfficialCSX) and follow us on Twitter (http://twitter.com/CSX). I was first "introduced" to this Middlebrook Industrial Track back on September 14, 1983 while driving Route 22 east. Lady Luck was smiling on me that day as it was my good fortune to catch NJT 5681 and NJT 5908 getting ready to push across a string of ballast cars into the Chimney Rock Quarry in Bridgewater (NJ). In my mind seeing this move was for me a rarity since most of these moves occurred in darkness when traffic wasn't as congested. With grade crossing signals signaling its approach, NJT 5681 and NJT 5908, two GP7s, started to slowly push the string of hoppers over eastbound 22, through the median and over westbound 22 into the safe confines of the quarry. Once the hoppers were in their designated spot for loading, they were uncoupled from from the power. Now it was time to head back across Route 22. With his horn blaring, grade crossing signals flashing their warnings and this engineer keeping a watchful eye out for drivers that might be oblivious to all these warnings, NJT 5908 started his approach and made it across with no problems. 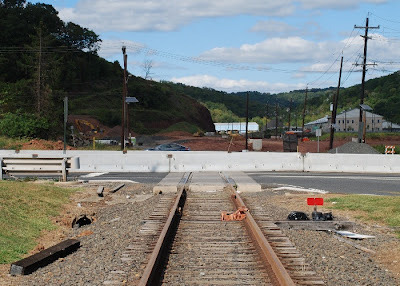 While driving down the same stretch of road recently, I noticed that those concrete barriers known as "jersey dividers" had been placed over the tracks leading into the median. Where the quarry used to be was a variety of construction. Gone were the railroad grade crossing signals that once warned motorists of an approaching train. Commercial development had taken over where the quarry once was and now it was good-bye to this siding. NORFOLK, VA – Sponsors Norfolk Southern Corp. (NYSE: NSC) and GE Transportation (NYSE: GE) today kick off the second Railroad Sustainability Symposium amid rare longleaf pines and endangered red-cockaded woodpeckers at Norfolk Southern's 14,000-acre Brosnan Forest Conference Center near Charleston, S.C.
"We're delighted to reciprocate as host of this year's symposium following GE's hospitality in welcoming U.S. and international rail industry leaders and sustainability experts to its corporate campus for the first railroad sustainability symposium last year," said Blair Wimbush, Norfolk Southern's vice president real estate and corporate sustainability officer. Pete Lawson, ecomagination leader at GE Transportation, a major supplier of fuel-efficient low-emissions locomotives for the rail industry, said, "We had barely adjourned last year's symposium before people started clamoring to visit Norfolk Southern's Brosnan Forest, and we're pleased to partner again with Norfolk Southern to sponsor the 2012 symposium at this ecological gem. At GE, we believe that innovation can solve the world’s toughest challenges. When you add to that collaboration with partners like NS, together we can work to deliver more efficient and economical environmental solutions that our industry demands." Topics for the three-day conference include current practices in sustainability, an industry perspective from the Association of American Railroads, "Conservation, Community, Collaboration and Communication," and a shipper's perspective on sustainability, among others. Symposium attendees will learn about best practices in sustainability and environmental responsibility from speakers representing organizations and companies such as GreenOrder, UPS, the National Fish and Wildlife Foundation, C2Invest, Chesapeake Energy Corporation, TFC, Coca-Cola, BMW Manufacturing, and the co-sponsors. In between, they'll have the opportunity for forest tours to learn more about the longleaf ecosystem. In 2008, Norfolk Southern donated a conservation easement to the Lowcountry Open Land Trust, permanently protecting more than 12,000 acres of the forest from development. The property is a safe harbor for numerous colonies of endangered red-cockaded woodpeckers among one of the nation’s largest remaining stands of longleaf pines. For more about Norfolk Southern’s sustainability initiatives, visit www.nssustainability.com. GE Transportation, a unit of GE (NYSE: GE), solves the world’s toughest transportation challenges. 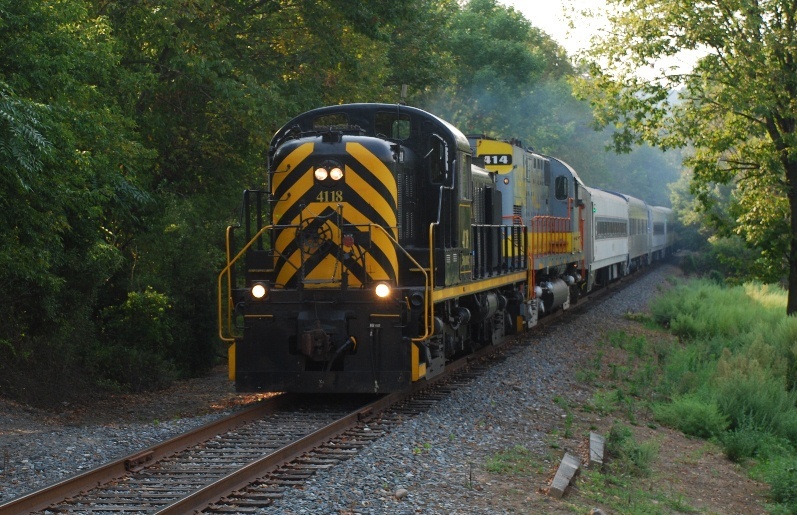 GE Transportation builds equipment that moves the rail, mining and marine industries. Our fuel-efficient and lower-emissions freight and passenger locomotives, diesel engines for rail, marine and stationary power applications, signaling and software solutions, drive systems for mining trucks, underground mining equipment, energy storage systems, and value-added services help customers grow. GE Transportation has approximately 12,000 employees worldwide. For more information visit the company's website at www.getransportation.com. NORFOLK, VA – Underscoring a record of continuous improved performance in corporate environmental responsibility and in reducing its carbon footprint, Norfolk Southern Corp. (NYSE: NSC) has achieved its best-ever score in the S&P 500 Climate Change Report released by the Carbon Disclosure Project. The company's 2012 carbon disclosure score is 88, 15 percent better than its 2011 score of 76 and the highest score the company has attained in the five years Norfolk Southern has participated in the survey. The Carbon Disclosure Project is an independent nonprofit organization supporting greenhouse gas emissions reduction and sustainable water use. The scores released in its annual Climate Change Report are regarded as a measure of climate mitigation performance and quality of disclosure. In addition to a score, a grade is awarded on a scale of E to A. Norfolk Southern's grade for 2012 is B, matching its 2011 grade. "We are pleased to have demonstrated continuous improvement in our disclosure score during the years we have participated in the Carbon Disclosure Project," said Blair Wimbush, NS vice president real estate and corporate sustainability officer. "The 2012 result exceeded our goal and puts Norfolk Southern in the high range of companies disclosing, well above the average disclosure score of 70. This positive trend complements our sustainability goal to achieve industry leadership in fuel conservation, emissions reduction, efficient energy use, recycling, use of renewable materials, and environmental partnerships," Wimbush said. Among efforts to lessen the company's environmental impact, Norfolk Southern has attained 60 percent of a five-year goal to reduce emissions per revenue ton-mile 10 percent by 2014. With reforestation playing a key role in its carbon mitigation strategy, the company has partnered with Green Trees to plant more than 6 million trees in the Mississippi Alluvial Valley. For more about the company's environmental programs, visit www.nssustainability.com. The Carbon Disclosure Project collects data from the world's largest companies on behalf of 655 institutional investors with combined assets of $78 trillion. For its 2012 report, more than 3,000 companies, including Norfolk Southern along with 81 percent of the Global 500 and 68 percent of the S&P 500, responded to a climate change questionnaire in 2011. One down and only nineteen to go! Finally photographed my first NS heritage unit, the Central of Georgia! Followed its progress east as the leader on NS 66Q, a ethanol train, by way of the Internet and hoped that it might come through in daylight. Passage of previous heritage units through NJ have been during the work week, under the cover of darkness or inclement weather. Finally I was going to get a chance to photograph one in excellent sunlight. Now all I had to do is wait for its arrival here in Three Bridges. My scanner was quiet most of the morning prompting me to think has this train been held up somewhere? Patience and perseverance was needed on my part to get this photograph! Another railfan stopped by to inform me that "...66Q was holding at Pattenburg for 21M to go west. Once that happened, 22V and 212 would run ahead of the 66Q" Hmmm... about one more hour I assumed before the C of G would be in my camera's lens. My estimation was a bit off as ninety minutes later, 22V's headlight appeared in the distance. 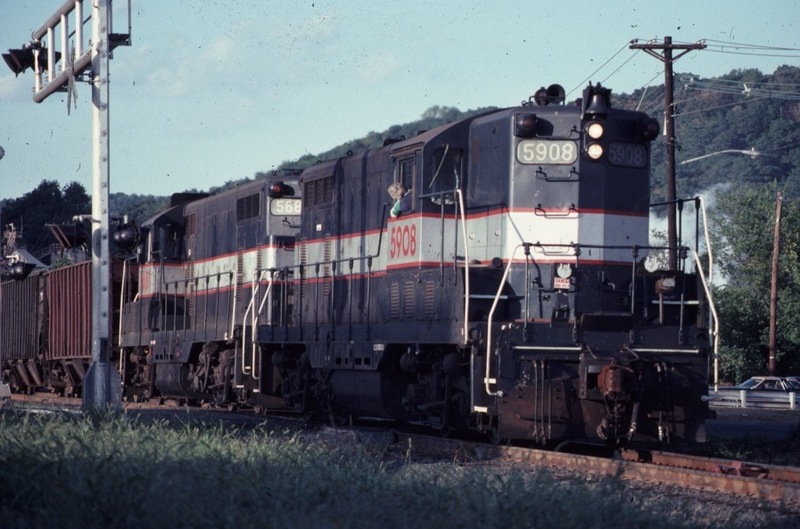 NS 9565 and NS 8701 would bring this consist of COFCs east. Next up was 212 with NS 9313, NS 9964 and NS 9912. Finally, NS 8101 leading NS 8348, NS 8988 and NS 2758 leading a long string of tank cars and looking really good passed through the Three Bridges Main Street grade crossing. Also see our post on Wednesday, below. 1:00 Bill Greenberg Morris County Traction Co.
10am – 4:30pm Exhibits (Free) and SALE of Memorabilia, Antiques, Books, etc. Trains: Historic, old electric and diesel locomotives, passenger cars, freight cars, and track cars. Some have been restored and some await restoration. Feel free to walk around and get a close look at these giants of the rails. Military vehicles, antique trucks, and vintage buses. 10:00, Noon, & 4:30 Diesel locomotive air-horn are blown one at a time. North Jersey Electric Railway Historical Soc. JACKSONVILLE, Fla. - September 13, 2012 - CSX Corporation (NYSE:CSX) today announced that the company earned a place on the Carbon Disclosure Project (CDP) S&P 500 Carbon Disclosure Leadership Index (CDLI) for the third consecutive year, and for the first time is recognized on the CDP Global 500 Carbon Disclosure Leadership Index. These leadership indices recognize companies that display a strong commitment to climate change information disclosure. "Environmental stewardship and transparency continue to be top priorities for CSX," said Michael J. Ward, chairman, president and chief executive officer. "This honor is evidence of CSX's continued recognition that environmentally-responsible operations are good for our customers, for our communities, and for our shareholders." CSX is the only railroad listed on either disclosure index and its score of 95 was the fourth-highest on the 53-company S&P 500 CDLI and second-highest for S&P industrial companies. The score also placed the company fourth among all global industrial companies. CSX's score was based on the company's responses to CDP's questionnaire, which focuses on greenhouse gas emissions, emissions reduction targets and the risks and opportunities associated with climate change. The CDP represents 655 institutional investors with $78 trillion in assets. "Companies that make the Carbon Disclosure Leadership Index have demonstrated strong internal data management practices for the measurement of greenhouse gas emissions and energy use," said Paul Simpson, chief executive officer of CDP. "They are also giving clear consideration to the business issues related to climate change and their exposure to climate-related risks and opportunities. This is vital to realizing greater efficiencies, protecting the business from risk and capitalizing on opportunities." This year, CSX committed to reducing greenhouse gas emissions intensity by 6 to 8 percent by 2020, after reaching its previous goal of an 8 percent reduction one year ahead of schedule. "As CSX invests in our network to meet America's growing freight transportation needs, innovative solutions that increase efficiency and reduce the use of valuable resources continues to be a critical component of our strategy," said Ward. The Carbon Disclosure Project (CDP) is an international, not-for-profit organization providing the only global system for companies and cities to measure, disclose, manage and share vital environmental information. CDP harnesses the power of market forces, including 655 institutional investors with assets of US $78 trillion, to collect information from companies on their greenhouse gas emissions and assessment of climate change and water risk and opportunity. CDP now holds the largest collection globally of primary climate change and water data and puts these insights at the heart of strategic business, investment and policy decisions. Please visit www.cdproject.net to find out more. CSX Corporation, based in Jacksonville, Fla., is one of the nation's leading transportation companies, providing rail, intermodal and rail-to-truck transload services. CSX's network spans approximately 21,000 miles, with service to 23 eastern states, the District of Columbia and two Canadian provinces. CSX's network connects more than 240 short line railroads and more than 70 ocean, river, and lake ports. More information about CSX Corporation and its subsidiaries is available at www.csx.com. Like us on Facebook(http://www.facebook.com/OfficialCSX) and follow us on Twitter (http://twitter.com/CSX). NORFOLK, VA. – John P. Rathbone, executive vice president finance and chief financial officer of Norfolk Southern Corporation, will address the 2012 Citi Global Industrials Conference at 11 a.m. EDT on Thursday, Sept. 20, 2012, in Boston. Interested investors can listen via simultaneous webcast at http://www.veracast.com/webcasts/citigroup/industrials2012/81205327.cfm. The presentation will be posted at www.nscorp.com. Norfolk Southern Corporation (NYSE: NSC) is one of the nation’s premier transportation companies. Its Norfolk Southern Railway subsidiary operates approximately 20,000 route miles in 22 states and the District of Columbia, serves every major container port in the eastern United States, and provides efficient connections to other rail carriers. Norfolk Southern operates the most extensive intermodal network in the East and is a major transporter of coal and industrial products. CSX Transportation has implemented an interim plan to accommodate deliveries pending repairs to the Bayside Coal Pier, one of two piers at CSX's Curtis Bay coal facility in Baltimore. The shiploader and pier were damaged on August 25 when a vessel destined for another facility struck the pier. The Bayside pier handles the larger Capesize vessels. The other pier at the facility, called the B&O Pier, handles the smaller Panamax vessels and was not affected by the incident. 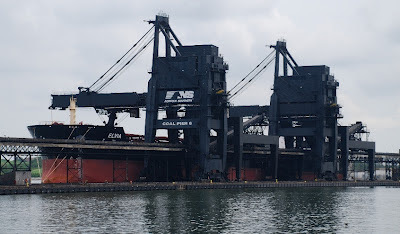 Until full loading capability to the Bayside pier shiploader is restored, Panamax vessels will be loaded to maximum allowable capacity at the B&O Pier, then shifted over to the deeper water at the Bayside Pier and topped off using clam shell loading equipment on barges carrying coal. The handling of Capesize vessels while the Bayside pier is repaired will be evaluated on a ship-by-ship basis with the potential to expand the top-off operation to those vessels or load at multiple terminals. A timeline for repairs to the Bayside pier is being developed and will be communicated when available. The Surface Transportation Board just declared that it considers an offer by Genesee and Wyoming Inc. to absorb RailAmerica to be "a minor transaction as defined by our regulations." The proposed cash transaction deal to combine the two largest short line and regional rail operators in North America is valued at about $1.4 billion. By contrast, it is interesting to note in September, 2012 (while deliberately not taking into account over 27 years of inflation and increased railway valuation) that on February 8, 1985, Norfolk Southern's initial offer of $1.2 billion for the 85% of Consolidated Rail Corporation's stock not owned by the employees was accepted by then-U.S. Transportation Secretary Elizabeth Dole. After spending 18 months and a reported $10 million on trying to marshal support for its offer ('sweetened' to $1.9 billion on May 9, 1986), NS ultimately withdrew its formal bid to acquire Conrail on August 22, 1986. Norfolk Southern never quite 'fell out of love' with 'Sweet Connie Blue Dress', though, and finally succeeded in acquiring 58% of Conrail for a $5.9 billion share in a $10.2 billion joint deal with CSX. Their application was approved by the STB on June 6, 1998. Ironically (coincidentally? ), the effective "Control Date" of the STB's decision was set as...August 22, 1998, exactly one dozen years to the day from when NS pulled the plug on its first attempt to get 'Big Blue'. Judging by the long, bitter fight for Conrail's independence (remember "LET CONRAIL BE CONRAIL"? ), I don't think Elizabeth Dole, nor then-Conrail Chairman L. Stanley Crane, ever considered the NS 1985 (or 1986) bid for CR to be "a minor transaction", by any definition! See a vintage diesel locomotives, electric locomotives, passenger and freight cars like those above. Visit the antique military vehicles, old trucks and restored New Jersey buses. See where locomotives and passenger cars are restored in our shop tour. Visit the Information and Sales Tables in the air conditioned Freight Station. Kids see NJ Transit’s great Operation Lifesaver railroad safety show! Free coloring books &more! Talk with retired railroad employees, bus drivers & soldiers & learn about working 50 & more years ago. Feast yourself on our hamburgers, hot dogs & other great food & snacks in the shade of our shop. A vintage bus will shuttle visitors between the parking lots and the festival or you may walk to it on the sidewalks. The festival is less than one block west of Main Street on Morris Avenue. There is no parking on Morris Avenue. There is, however on-street meter parking on Main Street. Boonton Municipal Parking Lot along Division Street east of Main Street. An overflow lot is at the NJ Transit station on Myrtle Avenue extension (ramp to I-287 southbound). From the south: Take the Main Street exit 44. Cross the bridge to Main Street. Turn right at the Division Street traffic light. After a very short distance on the right is the old railroad station parking lot. From the north: Take the Myrtle Avenue exit 45. Turn left on Myrtle Avenue and continue for .8 mile. Take the second right onto Main Street. Take the first right onto Division Street. After a very short distance on the right is the old railroad station parking lot. Pine Creek RR - Allaire State Park - Sept. 8-9. 60th Anniv. Celebration. Just a note to let you know that the weekend after LABOR DAY, Sept 8 & 9, the Pine Creek R.R. will be celebrating their 60th anniversary. Al Welter's model railroad club will also have 4 model layouts under a 20x40 foot tent. There will be HO-O and S gauge layouts and more. Once again the railroaders at the Pine Creek Railroad will present the annual Railroaders Weekend. Everything that can run, will run. Passenger and freight trains parade every hour. Come see vintage locomotives and trains in operation, shop tours, exhibits, displays, and much more! Trains leave every half hour from 11:00 AM to 4:30 PM." Bring family and friends and come out for a train ride!!! 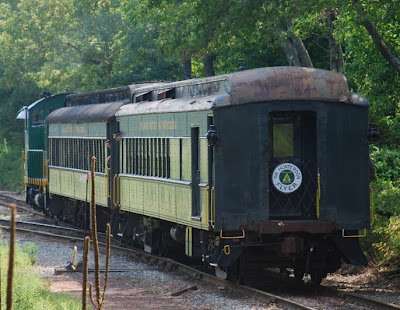 Sundays, September, 9th (Grandparent's Day) and September, 16th - our Tri-State cabooses will again be used in the excursion trains at the Whippany Railway Museum. L&NE 580 usually brings up the markers. Raritan River 10 and DL&W 896 next in line. Equipment Committee Chairman, Don Oberding and his 'crew' have been making great progress this year with the restoration and maintenance of these cars. The most recent activities have seen washing and Exterior painting has started on #10. The old kerosene burning stove has been removed from from #10. A period coal burning store to take its place. Come see the spiffed up cars in person. Tickets can be purchased on-line. Any unsold tickets may be purchased on-site. Bring your family and friends, help contribute to the museum and share the experience of the ride! Become a Farm Scene Investigator! You can play either game! Find all checkpoints in the maze AND also play Farm Scene Investigator. 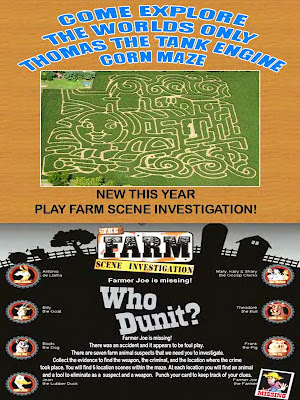 Find out who did in Farmer Joe! Complete all check points and you win a small prize. 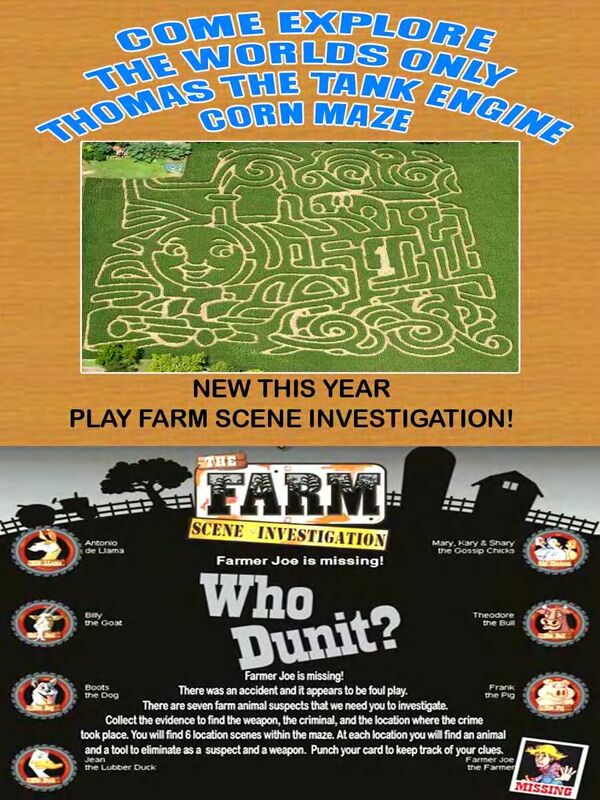 Solve the crime of the missing farmer and earn your FSI badge! Board the train in historic downtown Phillipsburg and journey to the CORN MAZE. Once you arrive at the corn maze you will go through a brief orientation and then the fun begins! Each group receives a map of the maze. We actually have a small and a large maze. Depending on your skill level and the amount of time you have you can do either one or both! In the maze there are 12 checkpoints and 12 check boxes to be checked off. As you find each check point there is a hole puncher at the check point. The game is complete when each check point is checked off and you find your way out of the maze! On site we have a beautiful picnic grove so feel free to bring your lunch and spend the afternoon. You can arrive on any train you like and stay as long as you like. Please remember, the only way home is by train and the last train heads North to the station in Phillipsburg at 3:45 pm in the afternoon. JACKSONVILLE, Fla., (August 30, 2012) - Fredrik Eliasson, CSX Corporation (NYSE: CSX) executive vice president and chief financial officer, will address the Seventh Annual UBS Best of Americas Conference in London, England on Thursday, September 6, 2012, at 11:50 a.m. Eastern Time (4:50 p.m. British Summer Time). Access to the webcast will be accessible through http://investors.csx.com. A replay and accompanying audio will be available following the conclusion of this event. Additionally, presentation materials will be posted on the company's website. The Great Train Robbery: Back by popular demand! Operates for one weekend only, September 15-16. Reservations now available. Corn Maze & Pumpkin Trains: September 29-30, plus every weekend in October. The Eerie Limited: New for 2012! October 20 & 27. Reservations now available. Sep 15/12 to Sep 16/12 Back by popular demand! Keep a watchful eye on your fellow passengers during your roundtrip ride between Flemington and Ringoes - you never know who may be a member of the dreaded Covered Bridge Gang! Geared towards younger children, our Great Train Robbery features members of the Covered Bridge Gang taking control of the train only to be apprehended by the Sheriff - but not without the help of his young deputies! Oct 20/12 to Oct 27/12 Calling all history buffs and ghost chasers! Join us for an evening excursion from Flemington to Ringoes and return. 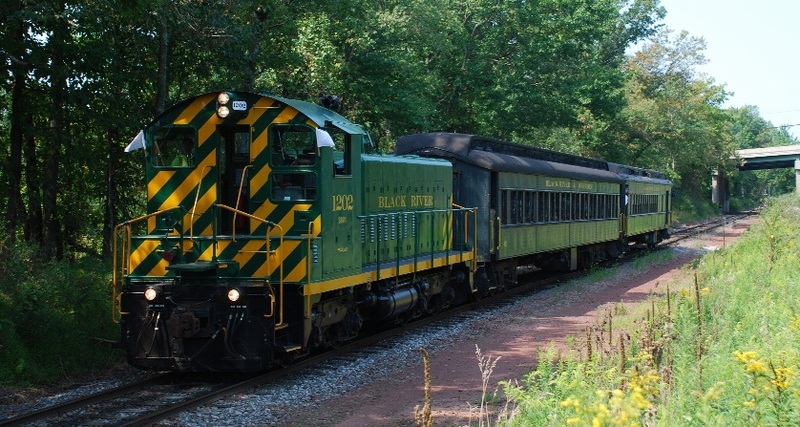 On the way, learn the stories of tragedies, wrecks, and hauntings from the long history of the railroad lines operated by Black River & Western. Reservations required. Recommended for ages 15 and up. Nov 23/12 to Dec 22/12 The North Pole Express offers an exciting train ride to North Pole Station to visit Santa & Mrs Claus! Enjoy hot cocoa and cookies, singing along with the elves, a chance to tell Santa your Christmas wish, and much more. This is a special experience the entire family won't forget. For complete details on this event please visit our website at www.flemingtontrain.com. On a recent trip down to Norfolk, the family and I decided to take a harbor cruise on the Elizabeth River. Our nautical trip would take us past NS's Lamberts Point coal loading facility and can best be described by saying it is both a huge and awesome facility. Research on this facility turned up the following information. It is considered the largest and fastest coal loading facility in the northern hemisphere. The facility's rail yard can accommodate 6,200 loaded hoppers. Pier 6 is 1,850 long while the Elvia is a mere 755 feet in length. On the NS website, it states "Twin tandem rotary dumpers feed the ship loaders for a combined dumping capacity of up to 8,000 tons per hour." Photo 1: Two boats carrying Navy Seals pass by the Lamberts Point facility on a training exercise. In the background can be seen some of the loaded NS hoppers. Photo 2: Shows the Malta registered bulk carrier Elvia being loaded at Pier 6. Photo 3: Note the two NS loaded coal hoppers on the right hand side of the image. 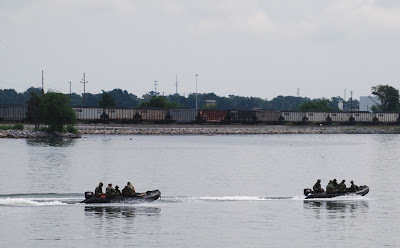 NORFOLK, VA. – The Norfolk Southern Foundation is committing $100,000 in emergency funding to the American Red Cross in Louisiana and Mississippi to help residents recover from the flood damages and power and water outages inflicted by Hurricane Isaac.